Atrial flutter, also known as AFL, is a health condition or arrhythmia where the atria of the heart has an electrical problem (a re-entry loop) that results in the atria beating at a rapid rate of about 242-360 beats per minute (bpm). Heart arrhythmia, also called cardiac dysrhythmia or irregular heartbeat, refers to a group of conditions where an individual’s heartbeat is irregular (e.g. it is too fast or too slow). Atrial flutter is the second most common tachyarrhythmia and atrial fibrillation (AFib) is the most common. While flutter waves are regular and can be seen as “sawtooth” P waves in electrocardiograms (ECG’s) (typical atrial flutter), electrical conduction blocks can sometimes occur and cause 2:1, 3:1 or 4:1 waves. Flutter waves might even appear as irregular bpm’s that are similar to an irregular arrhythmia. 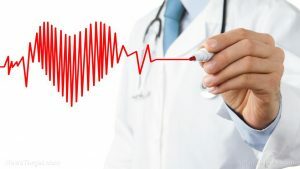 When the ventricular rate is very fast, some individuals with atrial flutter – especially older people and those with heart disorders – develop heart failure or chest pain. These people may also develop shock or very low blood pressure, albeit rarely. Consume more fish – Unsaturated fats in fish can reduce your risk for heart disease and protect your heart against abnormal heartbeats. Limit your meat and dairy intake – Saturated fats in animal-based foods like butter, cheese, whole milk, ice cream, and fatty meats are bad for heart health. Eat more fruits and vegetables – Fruits and vegetables are a good source of nutrition, fiber, minerals, and vitamins. Medications – Medications like calcium channel blockers can slow or regulate your heart rate. Other drugs like propafenone can be used to convert the atrial flutter rhythm back to a normal sinus rhythm. Blood thinners like warfarin can help prevent clot formation in the arteries, which can cause a stroke or heart attack. Surgery – Ablation therapy is used when atrial flutter can’t be treated with medication. It destroys the heart tissue that causes the abnormal rhythm. A pacemaker may be required after surgery to control your heartbeat. Alternative therapies – Cardioversion, or defibrillation, uses electricity to shock the heart’s rhythm back to normal. Atrial flutter, also known as AFL, is a health condition or arrhythmia where the atria of the heart as an electrical problem that results in the atria beating at a rapid rate. Some individuals with atrial flutter develop heart failure or chest pain. These people can also develop shock or very low blood pressure. Atrial flutter is often treated with medications, surgery, or alternative therapies.